What’s you earliest memory of writing or drawing? I’ve always enjoyed writing and drawing. I was left handed as a child, no matter how hard the nuns and my parents believed otherwise. They required me to write with my right hand however, so I think somewhere in there I decided to use my right and my left hands, each for different tasks which gave me a unique ability. Writing was an opportunity to really express myself, and through fiction, create fun and exciting stories. I was creating my own books shortly after I started reading. Flip page stories were my favorite. What’s more challenging: Writing or firefighting? Cat In The Hat and One Fish Two Fish Red Fish Blue Fish by Dr. Seuss. I really enjoyed the characters, the action and the happy faces. They always made me feel good and laugh. What was the inspiration the Nozzlehead series? 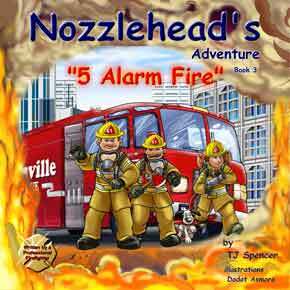 Nozzlehead Books were inspired by the many kids who visit our fire stations with their curious eyes and minds. 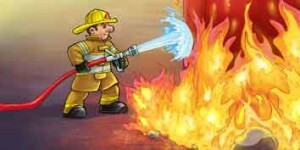 There are very few firefighter characters in children’s books today that have taken a pro-active role in educating, as well as entertaining kids about important issues. Nozzlehead books are theme-based and [are meant to] show kids important messages, [while] opening their minds to imagination and allowing for a real life role model without any super powers. I have just finished Book Three of the Nozzlehead Adventure Series. It should be published by the end of March. We are currently illustrating Nozzlehead’s “Funny little Mask” Book and have also just finished editing 2 additional books. Nozzlehead will be traveling to other countries to visit firefighters there and he will share his adventures with us. 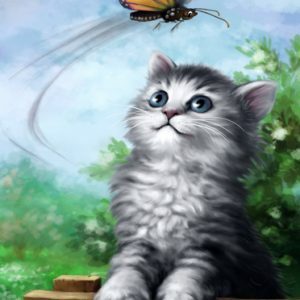 Tell us something strange and wonderful about you. I love motorcycles! I enjoy motors really, but motorcycles are my passion. I ride a big Harley Davidson motorcycle whenever the weather is warm enough. I love the warm breeze and the fresh air. I decided to build my own motorcycle a few years ago. It took me 4 months to build which might be some kind of record. “Your work is your signature.” This is something my father said to me once and it has been my creed in all that I do. Simply, do your best in all you do. You will be known by how you do your work and how you live your life. Be a good example, be honest, be kind and be fair. I always find room for improvement. 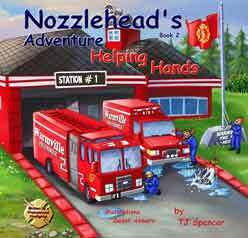 TJ Spencer writes Nozzlehead Books to share fascinating stories with children, but there is another purpose behind the books. TJ is an advocate for child safety and through the characters in his books he is able to provide subtle yet lifesaving messages to his readers. He has collaborated with authors, educators, counselors, agents, editors, and literary professionals in the creation of Nozzlehead Books. TJ grew up in the Wallingford area of Seattle with a large family including 7 siblings. He has studied Early Childhood Development, participated in multiple venues as an author, musician, storyteller and puppet master as well as kid wrangler supporting a multitude of children’s causes. 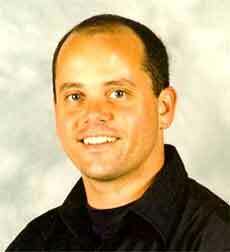 He became active as a member of the National Ski Patrol, studied at Northwest Community College, became an EMT and joined the Fire Department in 1989 and currently serves as a Professional Firefighter.